To get to the point in which zippers are today, there were three major stages in which it had to go through. 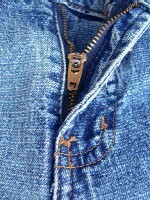 The first of these started back on August 29, 1893 when the first zipper-like fastener was patented by Whitcomb Judson. The strange thing about this patent was that at the time, it didn’t even work and he only sold twenty of them. All twenty were sold to the U.S. Postal Service as a way to close their mailbags. In those days it still had a ˜hook and eye’ design, and was called a ˜hookless fastener’. Twenty years later it was 1913 and a person by the name of Gideon Sundback was attempting to reinvent the hookless fastener. He would perfect his design which he dubbed the ˜separable fastener’ and patent it in 1917. His was just like the zipper of today, except for one major flaw “ it would rust after going through the wash. He saw a little more success in his early days than Judson did before him, but still no one really wanted them. The army did buy a bunch of them to use on their clothing and equipment, but other than that, really nothing was selling. This could be in part because no one could seem to figure out just how to use it. It was so confusing to people at the time that the so called ˜separable fasteners’ had to be sold with a set of instructions. The third era in zipper history came back in 1923 when B.F. Goodrich decided to order 150,000 of the things to use on his new product of the day “ rubber galoshes. He said that he liked the sound these ˜separable fasteners’ made (i.e. Z-z-zip) and from that, he coined the word ˜zipper’ and the name stuck. Now, have you ever wondered just where all those zippers come from and what’s up with the little ˜YKK’ on most of them? I mean, they are everywhere, and on practically everything that needs fastening now a day. Well, it all goes back to 1934 Japan and Yoshida Kogyo Kabushililaisha. Sixty years later, the company would rename themselves YKK and turn out to be the largest zipper manufacturer in the world. The firm, as it is run today, has grown to 80 companies in a total of 206 facilities around the world. To date they can be found in 52 different countries.